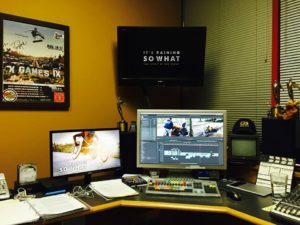 One of the great challenges of producing a documentary is trying to include enough detail to respectfully and authentically tell a story, while also keeping the story engaging and moving. I first met Joe in summer of 2012 and over the next four years we filmed hundreds of hours of footage and dozens of interviews which were eventually had to be edited down an 87 minute film. My greatest personal struggle during the process was that so much of the great content about Joe and his story had to end up on the cutting room floor during the edit because we just couldn’t include it all. If we had it probably would have been a 30 part docu-series! Enter, Peter Frick-Wright a writer, creator, producer, storyteller, and radio maker from the Pacific Northwest. 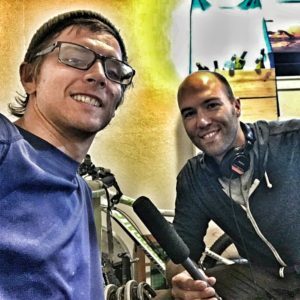 He’s a graduate of the Salt Institute, where they teach radio storytelling, and also a mountain biker, bug-eater, and frequent contributor to Sierra, Men’s Journal, Outside, and Bike. 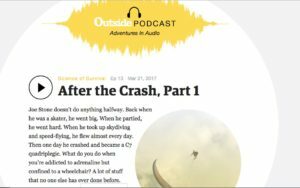 Peter had been producing a podcast series called Thirsty Minutes West aka 30|m|w and recently joined up with Outside magazine to launch The Outside Podcast. 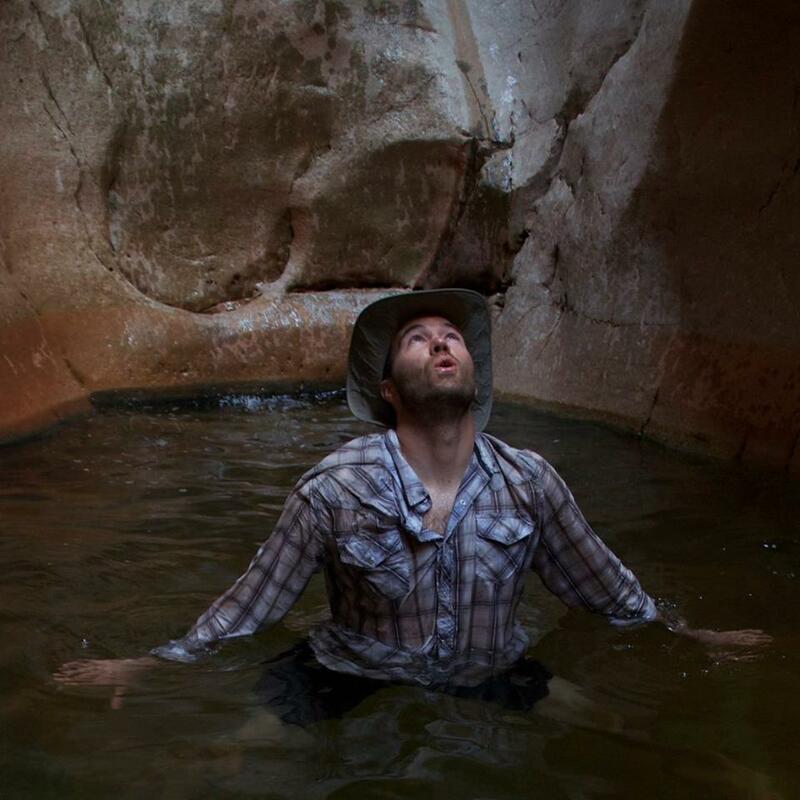 The first miniseries is on the Science of Survival, which is just like it sounds: stories of life and death, specifically how our bodies respond to heat, cold, being struck by lightning, and being trapped underwater. We were thrilled to learn that Peter had connected with Joe last fall, just as we were completing the final production of It’s Raining, So What. 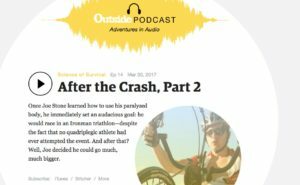 He was interested in learning more about Joe’s life and experiences surrounding his accident and recovery which ultimately resulted in this great two episode podcast in the Outside series. So whether you have seen the film or not, these two riveting episodes, created and produced by Peter, really shed a light on many of the aspects of Joe’s story that we were not able to include in the film. When I listened to them for the first time I was in awe at the level of detailed storytelling and knowing Joe, his family and Amy as well as I do, I could visualize every moment of our journey all over again. I actually had the thought at one point that this would make a great movie some day! Like what you heard? Share it with the world! We are so honored to share this great podcast with you and encourage you to let us know what you think about it, what you liked, and what you learned. If you like it please share it with everyone you know! Many thanks to Peter Frick-Wright, Joe Stone, Outside Magazine, and The North Face (and their new Apex Flex GTX jacket) sponsor of the Outside podcast, which by the way if you want to say “it’s raining, so what!” this Apex Flex GTX jacket is the perfect thing to help you do that!